Lake Texoma water temperature is 58-61 degrees and lake elevation is 608.67. 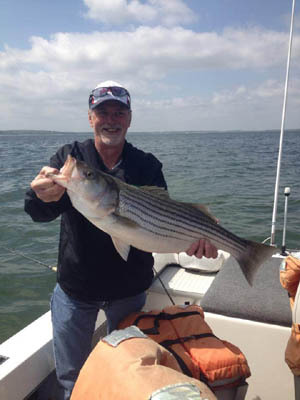 Striper fishing for the start of 2014 has produced some really nice fish.Although were not into the feeding frenzy yet we are seeing some big fish being caught this month. 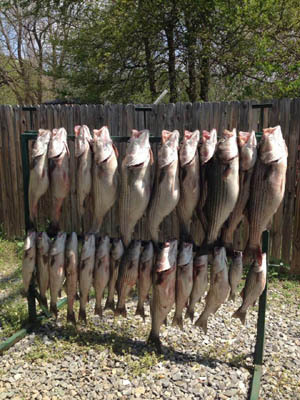 Stripers are stacked from north island to west of the Hwy 377 bridge. Our biggest challenge the past few weeks has been the weather mainly big wind.I’m fishing live bait working flats and ledges in depths from 15-50 ft. of water. Stripers are also being caught with the Alabama rigs working ledges and structure or simply trolling them along the flats. I’ve had some great trips this spring only to go out and struggle for bites the following day and until our stripers spawn feeding is not real high on their priority list. I can say things are picking up almost daily a lot of fish over the slot being caught when you get into them.By months end we should be into our prime time striper fishing with a good amount of numbers being caught. 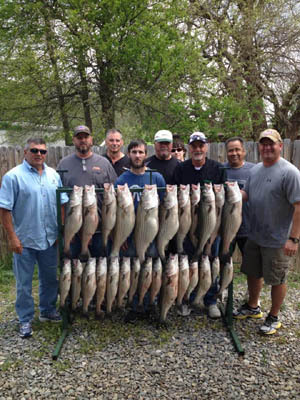 Weekends are filling fast and are the first to go.If your thinking about booking a trip on Texoma now is the time.